The Alpine X800D-ML, optimised to integrate into Mercedes Benz ML, makes in-car entertainment a bigger and better experience with its 43% larger 8″ touch screen. This is the ultimate infotainment system specifically designed for ML (W164) and GL (X164) providing the latest media compatibility, cutting-edge navigation technology and audiophile sound quality. All components are precision engineered to fit into existing locations and integrate seamlessly with the vehicle’s electronic systems. Enjoy brilliant picture quality from the astounding 8” high-resolution display, the latest digital media compatibility and Bluetooth hands-free phone functionality. What’s more, the premium audio system is superbly matched and tuned for the most exhilarating, hi-fidelity audio experience. You and your family will discover a new level of entertainment, premium sound quality and the most advanced navigation system on the road. For details on these and pricing, please contact your local Authorised Alpine Dealer. For further information on the Alpine X800D-ML 8? 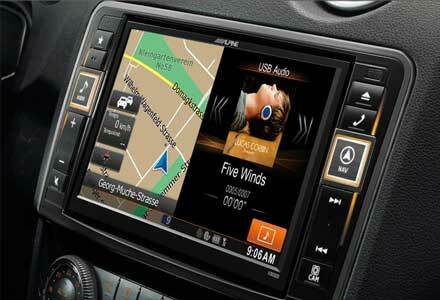 Advanced Navigation Multimedia Station, click here. When Alpine set out to study the ML driver’s car life, Alpine had only one goal in mind: to create a high-end infotainment system that exceeds all expectations an ML owner may have. With the Alpine X800D-ML upgrade you can enjoy stunning playback of music and video from CD/DVD, iPod/iPhone and USB, or built-in DAB+ digital Radio with the addition of RDS showing exactly what you’re listening to. The HDMI input enables high resolution display of video and content output from compatible smartphones and devices, and MirrorLink lets you connect compatible devices to play music and use apps, as well as navigation. 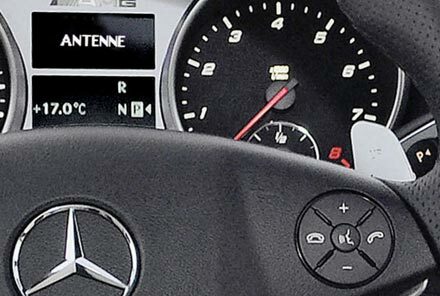 The innovative ‘One-look Navi’ allows a 50/50 split screen mode which displays navigation and the selected source for convenient operation and information at a glance. With its premium navigation you have high-res maps with live traffic updates, text-to-speech, 3D landmarks, fixed speed and red light camera alert, 4WD off road maps and an enhanced POI database. 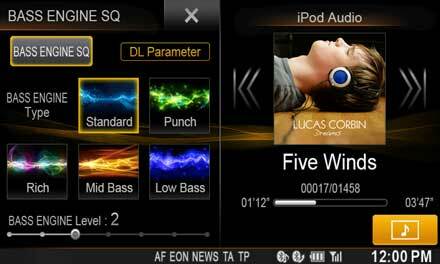 What’s more, sound tuning options include the TuneIt app for iPhone and Android, and built-in Bass Engine SQ, allowing precise personalised tuning for the best sound quality. The 8-inch (20.3 cm) high-resolution display is 60% larger than the original ML display and features the latest video technology for outstanding picture clarity, contrast and resolution. This allows navigation maps to be displayed in stunning detail, while movies or video clips become a real cinematic experience. It also contributes to driving safety. 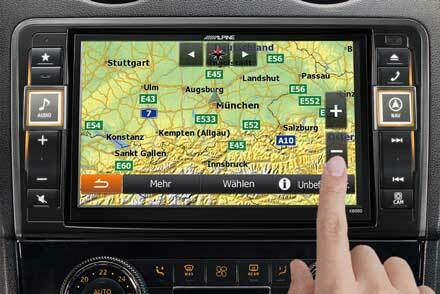 Navigation map details are easier to see and destination input keys appear larger and are easier to operate. It requires extensive research and detailed understanding of the vehicle to design a Head Unit that perfectly integrates with the vehicle’s electronic systems. The Alpine X800D-ML is fully compatible with the ML steering wheel control buttons and the multi-information display in the instrument cluster to maintain all important vehicle functions. The system also automatically “wakes” when the driver unlocks the doors. 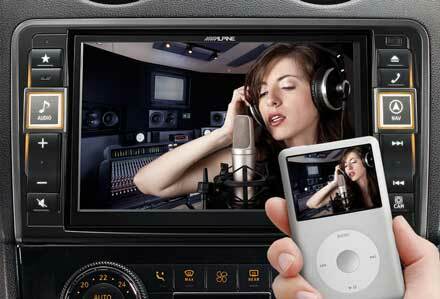 The Alpine X800D-ML allows you to enjoy movies, music videos or? TV shows from many different sources, such as DVDs from the built-in optical drive, USB sticks, latest smartphones with HDMI output or portable video devices connected to the A/V connector (optional cables may be required). You can also connect your iPod or iPhone to enjoy your video content on the large 8-inch display. For driving safety the video playback feature is only available if the vehicle is not in motion. Connect your HDMI enabled smartphone or portable media player via HDMI connection to enjoy all your video content on the Alpine X800D-ML’s high-resolution display. Full digital data transfer and the WVGA display ensure excellent image quality. An optional HDMI cable (KCU-610HD for iPhone, Sony Xperia ACRO and Motorola, etc or KCU-610MH for HTC ONE, Samsung Galaxy S4, Sony Xperia Z, etc) is required. 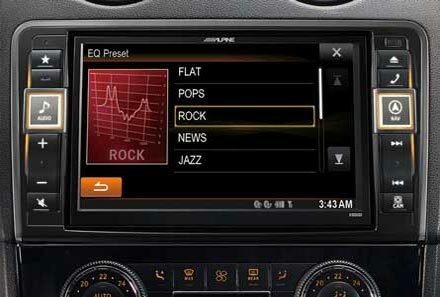 The Alpine X800D-ML works with Alpine’s cool and convenient Alpine TuneIt App to bring you custom sound tuning features right from your smartphone. The Alpine X800D-ML puts the power of advanced sound processing in your car with BASS ENGINE SQ to maximise bass sound and overall tone balance, plus lots of custom tuning functions like Digital Time Correction and 9-Band Parametric EQ. 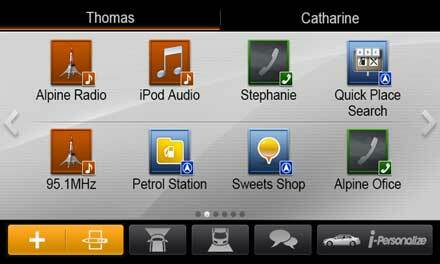 Best of all, you can control them easily from your smartphone with the Alpine TuneIt App. The built-in Bluetooth® module allows wireless connection of a mobile phone for hands-free communication, while frequent software updates ensure full compatibility with the latest phones. A very intuitive user interface makes it very easy to operate and also includes a speed dial function for the most frequently called numbers. Bluetooth® also enables audio streaming from the phone: audio content or even internet radio can be wirelessly transferred to the Alpine X800D-ML. 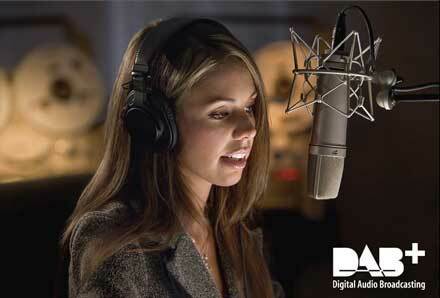 Alpine is known worldwide for excellent sound quality. Our audio specialists engineered the Alpine X800D-ML with greatest attention to detail – from selection of high-grade components to extensive audio tuning – to deliver a high-end sound experience for the ML. The system also offers many sound adjustment functions such as digital time correction and professional equalisation to allow users to adjust the system to their own preferences. If you and your spouse or another person frequently drive the car, you can both save your own user profile. When you enter the car, Bluetooth automatically connects the phone and initiates your profile. 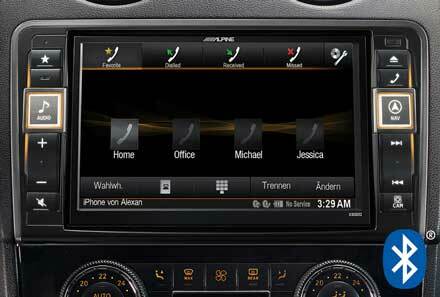 The profile includes the basic operating screen as well as favourites, phonebook, radio presets and camera view. You don’t have to manually input settings each time, saving time and making your whole system more convenient to use. My Favourites lets you put three pages with each eight frequent actions on one screen for one-touch selection, and arrange the layout the way you want it by dragging icons. Tune in your favourite radio stations, search your favourite POI categories, or call your favourite people without scrolling through the phone book. You can also select the background colour and match audio settings to your car model. And all this works for two people, based on Bluetooth phone recognition. Alpine’s innovative “One Look” split-screen technology allows the driver to view the navigation map and audio playback information at one glance. 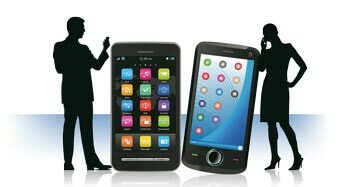 This eliminates the need to switch between different applications. 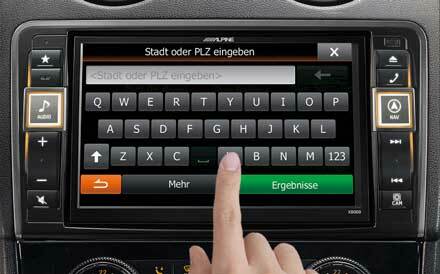 The user can switch from regular to One Look view with just the touch of a button. This function is especially useful on long highway trips. The rear-view camera automatically activates when reversing and also mutes the audio so you can hear the parking sensor signals. 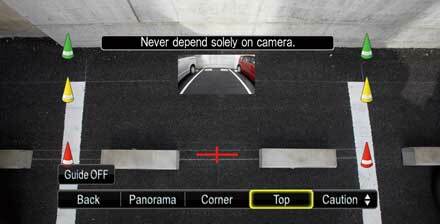 You not only have a clear view to the rear, you can also see useful distance guides that are programmed to exactly match the ML measurements for easier parking. You have a choice of four viewing modes. 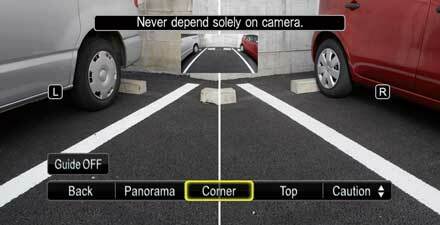 Multi-view splits the screen so you have a clearer view of both left and right behind the car. Top view is very convenient when backing up to hook up a trailer, enabling you to get within centimetres of the trailer. There’s also a picture in picture function that shows the regular rear view in a small screen when you’ve selected a special viewing mode. Optional Multi-View Camera (Alpine HCE-C252RD). Camera Installation Kit (Alpine KIT-R1ML) compatible with ML model year 2008 and newer. This top-class speaker package includes a front system with soft dome tweeters and large midrange speakers, plus a 20cm high performance subwoofer. All speakers are perfectly matched to the digital amplifier for superb audio quality with optimum sound staging. They are also specifically designed to fit in the ML’s original speaker and subwoofer locations. Premium Speaker and Sub-woofer System upgrade (SPC-100ML). Includes installation brackets, wiring harness, antenna adaptor, CAN bus interface and DAB antenna for complete installation. Sound In Motion, your Premium Authorised Alpine Dealers, Stockists and Installation Centres on the Sunshine Coast.